Murder is such a dirty word…New York Times bestselling adult true crime author Gregg Olsen makes his YA debut with Empty Coffin, a gripping new fiction series for teens based on ripped-from-the-headlines stories…with a paranormal touch.Crime lives--and dies--in the deceptively picture-perfect town of Port Gamble (aka “Empty Coffin”), Washington. Evil lurks and strange things happen--and 15-year-olds Hayley and Taylor Ryan secretly use their wits and their telepathic “twin-sense” to uncover the truth about the town's victims and culprits. 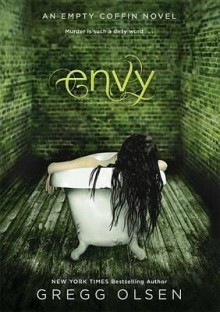 Envy, the series debut, involves the mysterious death of the twins' old friend, Katelyn. Was it murder? Suicide? An accident? Hayley and Taylor are determined to find out--and as they investigate, the twins stumble upon a dark truth that is far more disturbing than they ever could have imagined. Based on the shocking true crime about cyber-bullying, Envy will take you to the edge--and push you right over.